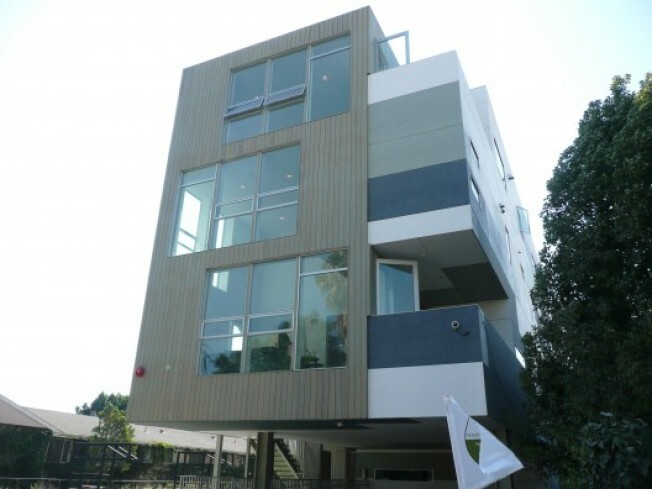 That latest project from Habitat Group developer Richard Loring (behind all those other recent Habitat projects cropping up all over the city) WeHo's Habitat on the Park, a 12-unit condominium on Havenhurst opened for sales way back in May. So how's this one doing? The building has four units in escrow, and prices chops have been steadily happening over the last few months, according to the listing agent. And the developer is still declining to say what architects firms are behind the project (rumor on the site was that SPF:A architects in Culver City was involved), but no, it's not a Lorcan O'Herlihy project, according to the agent (O'Herlihy also did some other Habitat projects). In the gallery is a two bedroom loft, a 1,646-square foot unit that's now at $1.068 million. During the tour, we asked about that crazy-looking construction, prompting another visitor to exclaim: "That looks like the pool!" If only. That's the 6000 square foot landscaped park. Expect trellises, and herb gardens, and more.